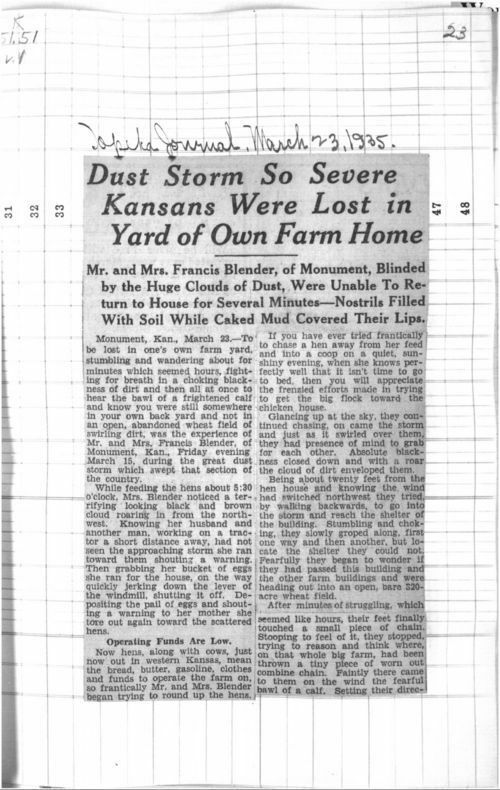 This article recounts the harrowing experience of Mr. and Mrs. Francis Blender of Monument, Logan County, who were caught unprepared during a dust storm in 1935. The couple was trying to round up their chickens to put them in the hen house when the storm hit, and they quickly became disoriented by the dense, blowing dirt. Luckily they safely found their way to the house. This story does an excellent job of illustrating how quickly these storms could begin. It is an interesting story that will grab students' attention and demonstrate how these storms affected the daily lives of Kansans.